Hyas - "Dat Music Freak"
Hyas - "Le Gardien Du Tekos"
Chinau - "Awareness (Feeling Of House Music)"
D-Nite - "Something About U"
Review: Belgian label House Running has been in operation for some time as a digital affair, but now they're cutting their releases on wax and giving them a physical presence in the field of discofied house music. 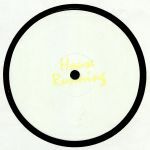 Hyas is making his first appearance with the two jams on the A side, both of which re-mould classic disco burners as stomping modern day house cuts. "Dat Musik Freak" is a heated, looped up riot of a track, while "Le Gardien Du Tekos" gets just as fierce and funky, channeling a little Detroit pressure in the extravagant filter usage and gritty rhythm section. Chinau's "Awareness (Feeling Of House Music)" is a lighter affair for easy going times, and then D-Nite rounds things out with the breakbeat-powered balladry of "Something About U."